Arrange a rack in the middle of the oven and heat to 350°F. Coat a 9x13-inch baking dish generously with butter. Halve the fruit, then remove and discard the pits. Cut into 1/2- to 3/4-inch-thick slices. Place in the baking dish and arrange into a single layer; set aside. Combine the eggs, sugar, cardamom, and salt in a large bowl and whisk until smooth and the sugar is dissolved. Add the flour and whisk until just smooth. Add the milk, 3 tablespoons butter, and vanilla and whisk until just combined. Slowly pour over the fruit (to prevent the fruit from floating) in the prepared baking dish. Bake until set, puffed, and light golden-brown around the edges, about 50 minutes. Place the baking dish on a wire rack and let cool for 15 minutes (the clafoutis will deflate). Cut into squares, dust with powdered sugar if using, and serve warm. Storage: Store leftovers in an airtight container in the refrigerator for up to 4 days. Reheat in a 300°F oven until warmed through. In Recipes-list.com we have selected the most viewed recipes from category - uncategorized . Enjoy the best recipes specially selected for you! 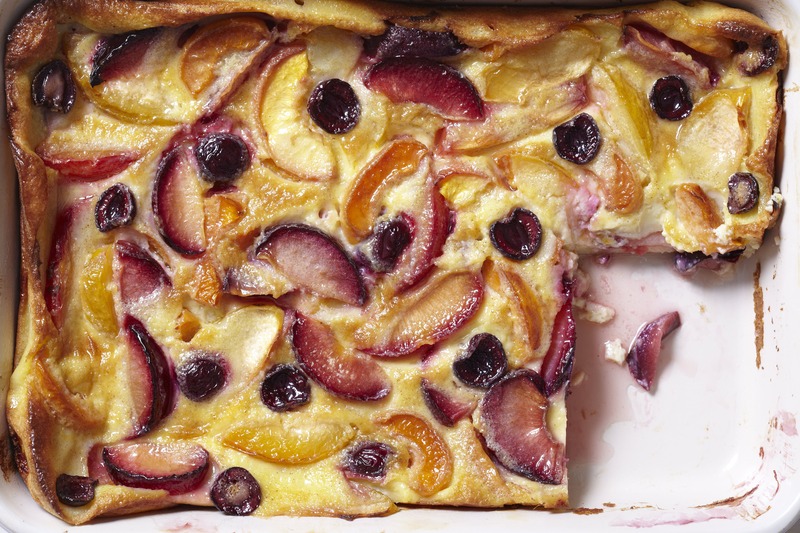 Cardamom and Stone Fruit Clafoutis is the right choice that will satisfy all your claims.